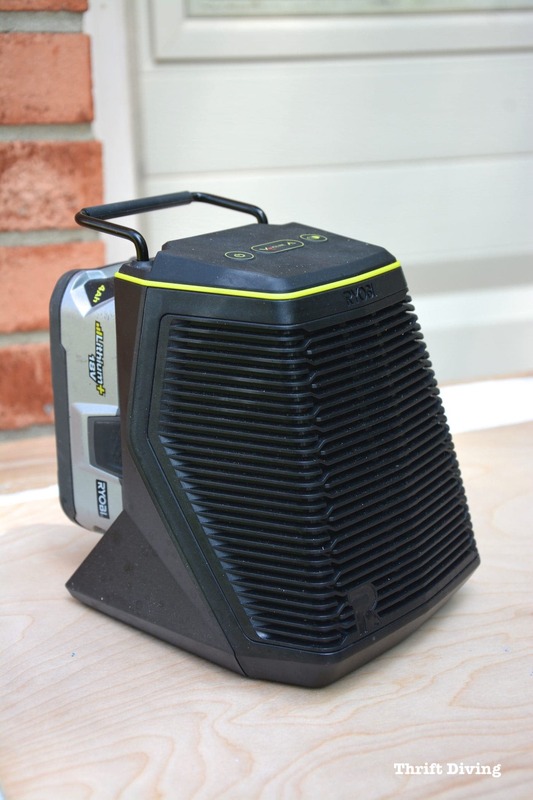 Stop by my house any ‘ole day of the week when I’m working on a project in the garage (and driveway) and I guarantee you’ll find me bouncing away to music from my RYOBI Wireless SCORE speakers. As much as I love DIY, working in a silent workshop is boring as heck. My mind wanders…I start over-thinking each step…and there silence zaps my energy. 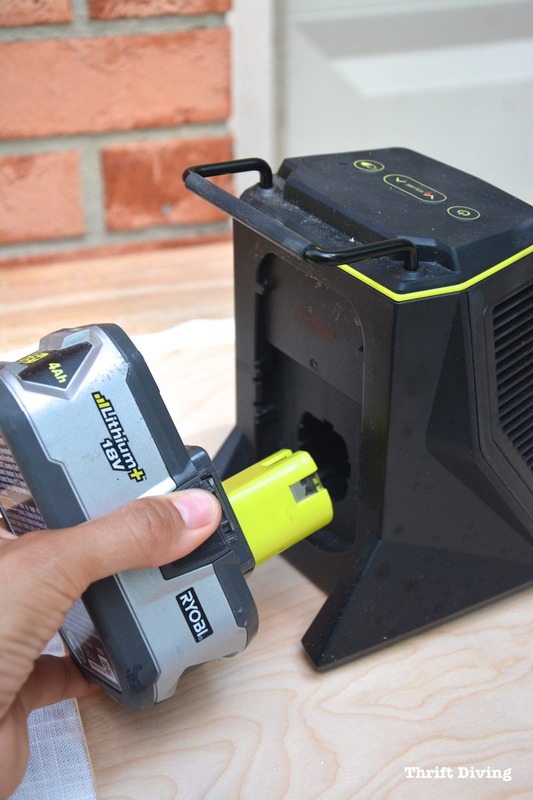 So back in the spring when RYOBI released their new SCORE wireless speakers and sent me a set of them to try out, my workshop did a happy dance. I generally listen to music, but I’d been using my older, larger RYOBI stereo that sits on my workbench and is too bulky to take up precious worktop space. If I’m working in the driveway, I can barely hear the music without cranking it louder. And the last thing I want is for my neighbors to complain about the bushy-haired woman wielding power tools in the driveway creating a musical neighborhood disturbance. But with this awesome wireless speaker set that allows up to 5 total small speakers to all be connected wirelessly, I can place them throughout my workshop (or in the house) and have music everywhere I am! Now, instead of silent boredom getting the better of me when I’m too far away from the stereo, I’ve got music to give me energy when I’m working on projects. Since they’re all connected wirelessly (and I can play music via Bluetooth or set it on an FM station), I have surround sound music from wherever I am! 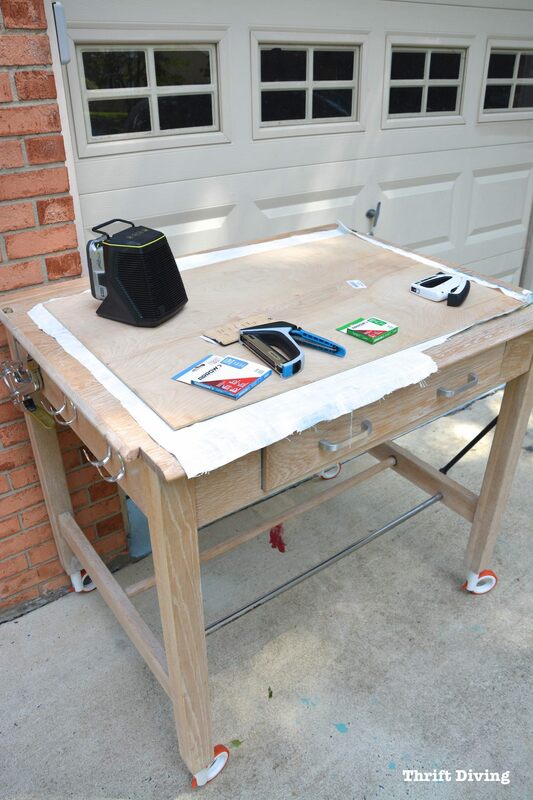 Most times, you’ll find me with a project on my workstation (the one I added the orange wheels) in the driveway, working on projects, with a SCORE speaker next to me. I like that they’re smaller than the other RYOBI stereo so it doesn’t get in the way. My oldest son, Kwabena, turned 11 over the summer and these speakers were the hit of the party. I set one outside for the kids…and two indoors for the adults. One thing I don’t like about wired speakers is that I’m not a master when it comes to all that electronics cords and wires. But with these SCORE speakers, right out of the box, they’re ready to go. All you have to do is connect the primary speaker to your Bluetooth phone or tablet wirelessly and–BOOM–the secondary speakers automatically sync up to the primary speaker! And while I’m in the driveway working, I’ve got music. When I walk back into the garage, I’ve got another speaker connected. And on the other workbench on the other side of the room, there’s yet another speaker connected! The fact that they run on the same batteries as my power tools means I don’t have to go searching for batteries. I can pop it off the power tools, stick it on the speaker, and keep moving. The set comes with an adapter, so if I need extended run time or I need my batteries for my tools, I can use the adapter. I recently have been doing lots of work in my rental townhouse in preparation for getting a new tenant, and I’ve even taken the speakers to the rental to keep me company while cleaning up and doing repairs! HA! Not a thing! And that’s not because RYOBI gave them to me at no cost. I’ve been using these speakers for about 4 months and I haven’t found one thing that I’ve said, “Now…why did they do that? ?” They’ve engineered them to be easy to use. And you’d be surprised how much bass is in those speakers. While in the driveway, I usually have to keep them turned down because the sound is so powerful. 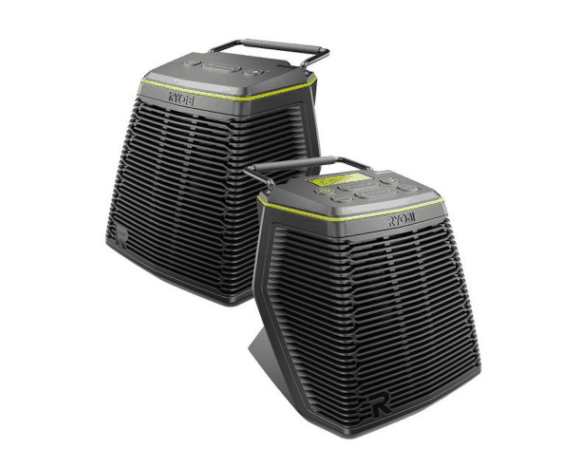 The speakers are only at Home Depot, where they’re exclusively sold. I’d use them while working on my jeep in the garage or woodworking in the garage. I’d use them on game day (it’s football season). I’d use them brewing beer in the garage. I’d use them cleaning / sharpening tools in the garage. I’d use them watching Thriftdiving YouTube videos in the garage. I would give it to my hubby, so that he can use it in his man cave. Omigosh! I’d love a set of these speakers! We’ve been building a composting toilet down at the bottom of our property and it is a boring slow job. We would surely make much more progress be-bopping around the site! 🙂 I love all these fabulous products you share and explain how to use!